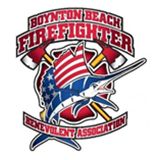 Boynton Beach Firefighter Benevolent Association Golf Tournament shared a post. It's a Texas sized takeover! Boynton Beach Firefighters are going to be at Texas Roadhouse on Thursday, April 25th from 3-10pm. 10% of the sales will be donated to the Boynton Beach Firefighters Benevolent Association. You'll have to come for dinner and find out. Whew!! We did it! 100+ boats and crew, 20 chili teams, craft beers from our very own Boynton Brewing District, big fish reeled in, delish bbq and lots of people putting in lots of hours to make it happen. Here's just a few of the faces that put it all together. THANK YOU!! To those that spent months prior prepping and the day of in the sun making it an amazing event benefiting the Kiwanis of Boynton Beach. The monies raised will go right back into our community. Ox, we hope you had fun watching from above. Come say Hi! while you're wandering around on the Ave today. We're at the Tennis Center this year, 2 blocks west of Swinton. Yes, the parade passes by where we are. We have our cool "Men of Fire" shirts for $20, BBFRD challenge coins and a photo op area for you and your crew to get that official event pic done. We are open from 10am - 6pm. Parade is at 2pm. Plenty of time to stop by our booth, grab some great food and beverage and still see the parade! Boynton Beach Firefighters Fishing Tournament & Chili Cook-Off Boynton Beach Firefighters Fishing Tournament & Chili Cook-Off shared a post. Thanks for the support ladies! Channel 12 is the one to turn to! Boynton Beach Firefighters Fishing Tournament & Chili Cook-Off Boynton Beach Firefighters Fishing Tournament & Chili Cook-Off added 31 new photos — at Harvey E. Oyer Jr. Park. Captains, anglers, lady anglers, chili chefs and giddy children from around South Florida competed valiantly for over $10,000.00 in cash and prizes! Tournament week began under small craft advisories, but ended PERFECT! 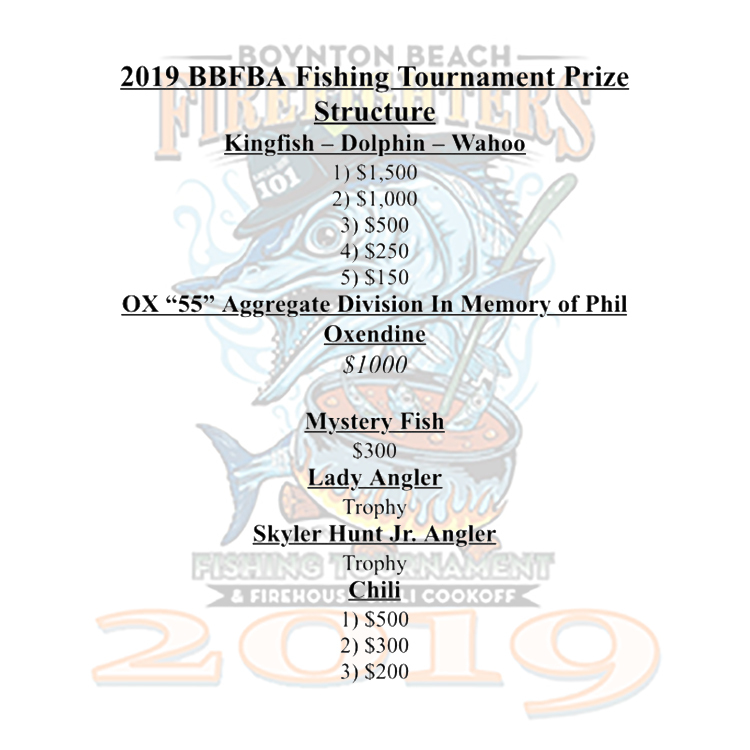 With seas barely two-feet, and over one-hundred boats along with their brassy captains, our 14th annual Boynton Beach Firefighter Benevolent (BBFBA) Fishing Tournament and Firehouse Chili Cook-off was a huge success! Mackerel royalty and large bull dolphin dominated the leader board. And, in a week that saw many cobia caught off Boynton, not one was brought to scale on this day. The sea is often fickle! It was also an emotional day for many of us, as we added a aggregate division this year in honor of Phil Oxendine. Phil, a retired BBFRD fire officer and tireless volunteer for this tournament since its inception, died unexpectedly last August. His presence is greatly missed , but his memory lives on within his beautiful family and his many friends! He would have been extremely proud today. Finally, the BBFBA would sincerely like to thank all the fishermen, sponsors, vendors; the many volunteers, our Mayor and city leaders, our fire chief, our firefighters, our retired firefighters, family and friends who all gave so graciously of their time and energy to make this event one of the most successful in our history, and one of the finest tournaments in South Florida! Site by EIP | © 2017-2019 - All Rights Reserved.